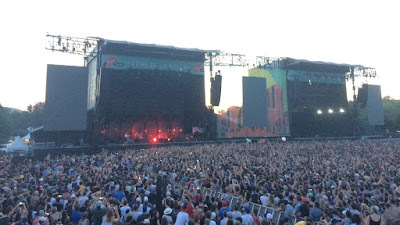 In the summer, William and a bunch of friends went to Montreal for Osheaga, the big music festival on the old La Ronde/Expo '67 site. They all got there by different modes of transportation — William drove up with a couple of guys in a van, leaving Halifax in the late evening and driving all night. Some of the other guys flew in or drove with other people. Once they got there, they all joined together and lived in a pre-arranged apartment. They had a grand time at Osheaga. They had been at Evolve in New Brunswick just a couple of weeks before and I think if William had to choose, he might choose Evolve just because Osheaga was so big. Here's a small part of the Osheaga crowd — a photo I borrowed off the Internet. But it was great; they heard some good music and got lots of sun and enjoyed themselves a lot. When it was over, some of the guys had to go home, including the ones that William had driven up with. But as it happened, William and a couple of his closest friends decided they'd like to have a couple more days in Montreal — and who wouldn't? So they settled in and did some sight-seeing and played tourist. A few days later, he texted me. "Where do we get the train?" William has taken trains in Italy, France, Germany, Belgium and England. In any of those places, his question would have made perfect sense. I would look it up, tell him which station to go to, tell him what time the trains were leaving. Unfortunately, in our country it's not simple. I told him to go to Central Station under the Queen Elizabeth Hotel, go to the ticket office and see what he could find out. It was Thursday. When he got back to me, he said, "No train today. The train tomorrow is sold out." I had checked it out by that time: departures from Montreal Wednesday, Friday and Sunday. Three trains a week. I take this quite personally. This train — the Ocean, formerly the Ocean Limited — played a significant part in my life. 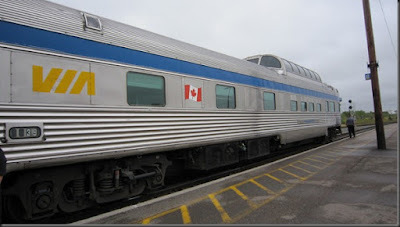 I lived in Montreal as a young woman and I travelled back and forth on that train several times a year. I was on a first-name basis with the porters and the sleeping car staff. This is one of my most-used photos, I'm sure you'll agree. I not only travelled by train but I took people to the station and waved them off and I met people who were coming to visit. The train was there and we assumed it would always be there. People accuse former Prime Minister Stephen Harper of saying, "Give me 20 years and you won't recognize this country." But Stephen Harper didn't say that. It was Brian Mulroney — Prime Minister from 1984-1993 — who said that. I remember him saying it because I very clearly remember thinking, "Why wouldn't we want to recognize our country?" Mulroney did a lot of damage to this country and one of the things he did was decimate our train service. In October of 1989, the New York Times reported it this way with the headline Trains To Be Cut In Canada. TORONTO, Oct. 4 — The Canadian Government said today that it would cut passenger train service by more than 50 percent nationwide, touching off bitter protests in a country that was stitched together by railroads in the 19th century and where trains and the people who ride them are the stuff of national folklore. The cuts, from 405 trains a week to 191 in the heavily subsidized rail network, had been expected for months because of Government budget cuts. . . 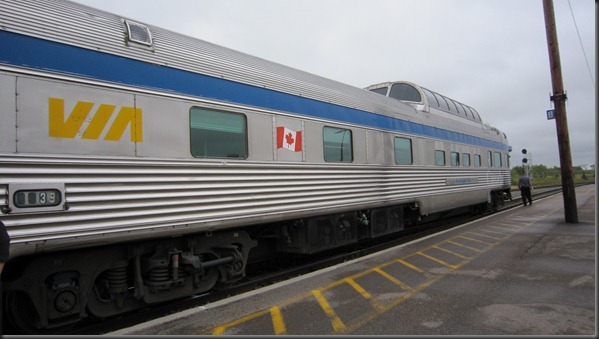 The Government-owned Via Rail Canada Inc. would end up offering little more than skeleton service in wide areas of the Maritime Provinces, along Canada's Atlantic coast, and in the western provinces of Manitoba, Saskatchewan, Alberta and British Columbia. Northern Ontario would be hard hit, too, as would parts of Quebec. . .
More than 2,700 of Via Rail's 7,300 employees would lose their jobs as a result of the cuts, but a confidential Via Rail report, copies of which were leaked to Canadian newspapers, said that nearly 60,000 Canadian jobs depended on passenger rail services, nearly 30,000 of them in tourism, and that many of these might be in jeopardy, too. . .
Mulroney said the cuts would be irreversible and he was right. In many places, the tracks were pulled up promptly. 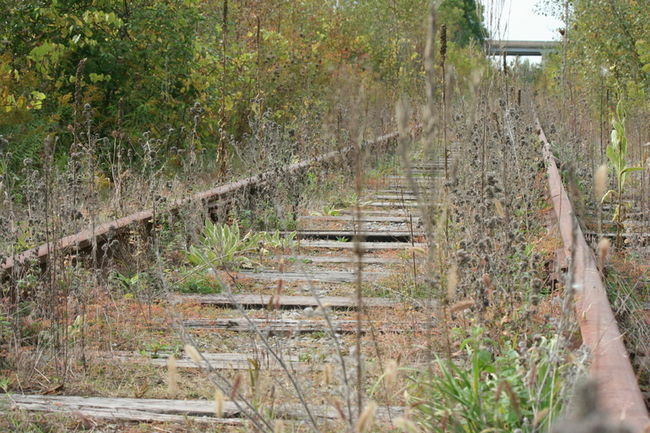 In other places, they've grown over with weeds poking up between the ties and the rails rusted and broken. He stressed, over and over, that this was all about money. We couldn't afford our trains. But getting rid of the trains was not good transport policy. I'm sure the research has been done (I'm not going to look it up right now) that shows the loss of our freight trains and the vast increase in the use of tractor-trailers on the highways has not been a more efficient or a cleaner alternative. As for passenger service, William's is only the most recent story. There are many stories throughout rural Canada where the loss of rail service went far beyond inconvenience. William got a flight home to Halifax, by the way. It was cheaper than the train ticket would have been. And that's a whole other story.